Hey there! I'm home from CHA and WOWWWW what an incredible experience that was to finally meet so many online stampin' friends. I promise to get the pics uploaded soon! Today I want to show this card I made with different Spellbinders dies and my MFT Beach Bum set. I just love this Thrift Shop paper....can't get enough of it. The red umbrella and the red blossom are up on foam tape. The Surf's Up Shapabilities umbrella was cut and embossed in Real Red, then I cut and embossed it again on a couple different patterns of the Thrift Shop DP, cut those out by hand, and glued them onto the red umbrella. I had a lot of fun making this card! Enjoy what's left of the weekend...and for all those finally getting home from CHA, hope you get lots of rest! This is so cute Denise. Love how you paper pieced this umbrella. ohhhh, CUTE!! Love how you did the umbrella! Can't wait to see the CHA pics!! WB!! OMGosh - how CUTE is this!!! Love these papers and the paper pieced umbrella is GORGEOUS!!!! Oh that umbrella looks awesome girl! Love those fun papers too! So glad you had a blast!! I am so glad you had fun Denise!! Wish I could have been there...maybe next time. Your card is incredible. Love the square blocking, sewing and the paper piecing. Gorgeous colors! HI Denise, this is very special. I'm with you, I adore the october afternoon papers, especialy thrift shop. This is amazing how you did that umbrella. I love the layout of this card too....and that paper is one of my favourites too!!! I cannot wait to see the pictures! LOVE the pieced umbrella! Adorable layout with all that stitching too! This is wonderful, Denise! I love the colors and terrific shapes. Oh, CHA--I am so jealous! Glad you're back and look how cute & sweet this card is---LOVE those papers, I need to pull mine out! Love this! So bright and fun. The paper is fabulous! I love your neat elegant style, wish I could get that right. Great card Denise. Glad you had a great time! Lovin this fun umbrella you made! Supah cute! Denise, it was SO great to meet you on Friday...finally!!!! This card is super sweet! Oh, I love this, Denise! Beautiful colors and patterns! Love the embossed flower surrounding the umbrella and the dimension to the umbrella! How fun this is!!! Cute cute CUTE!! Love the umbrella with the alternating patterns. Darling card, Denise. What a very pretty card! I love the umbrella you have designed. Super cute card! Such a cute, cute card! SO fun, Denise! 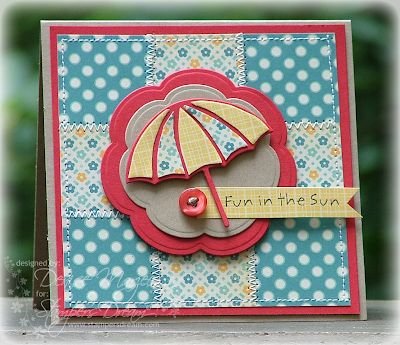 Love the fun umbrella and fabulous layout! .. enjoyed your CHA pics, too! !